Congratulations to the Chester Under 17 Colts who won the NWYA League 2 trophy following a 2-1 victory at Runcorn Town at the weekend. The team were presented with their trophy after tonight’s 6-2 home victory over Ashton Town to record their 20th victory from 20 matches this season. It would appear that Chester have missed out on the opportunity to sign 24-year-old Danny Williams from Kendal Town. The player, who had been on a season-long loan period at Chester this season, is believed to be signing for Scottish Premier League side Inverness Caledonian Thistle. Wing-back Williams scored two goals in 33+0 appearances for Chester. The football club have announced that Chief Executive Pat Cluskey has been made redundant, as has the position he filled. This announcement comes on the back of a board management restructuring review, which was undertaken by the club once Tony Durkin had been appointed chairman. Cluskey had been at the club for two and a half years. How fitting that captain George Horan should score the last league goal of the season as Chester defeated Worcester City in the final match to be played at their 108-year-old St George’s Lane ground. Chester completed their season as they had begun it at Oxford City with a 1-0 away victory to finish the season on 107 points, 16 ahead of second placed Guiseley. Horan scored the only goal of the game in the eighth minute heading home a Dave hankin cross, but it was the home side that created plenty of chances to perhaps earn a draw but some poor finishing from Mike Symons as well and some fine saves from John Danby secured the 34th victory of the championship season. Chester were reduced to ten men on the stroke of half-time as Matty McGinn was given a straight red card for a challenge on Tom Thorley. Both sides his the post in the second period with Iain Howard almost capping a final appearance in a Chester shirt with a goal as his shot glanced off the woodwork following a flowing move involving debutant Tom Peers, Tony Gray and Marc Williams. The two-leg semi-final play-off’s will be Halifax Town v Guiseley and Altrincham v Brackley Town. The matches will take place on Tuesday and Saturday. Chester were made to pay for a series of missed chances as they fought out a 1-1 draw at FC Halifax Town last night. Manager Neil Young only had 13 senior players to pick from with youth players Tom Peers and Sean Miller starting on the bench. The Blues squad were held up in traffic prior to the match which as a result kicked-off 15 minutes late. When it did, it was the visitors who started well taking a sixth minute lead through Marc Williams (pictured) who met a Nathan Jarman cross to prod the ball past ‘keeper Matt Glennon. Antoni Sarcevic saw a goal bound effort cleared off the line before the midfielder failed to convert a close range effort following good play by Danny Williams. Seven minutes before the break the Shaymen equalised as Alex Johnson beat John Danby to an inswinging free-kick to head the hosts level.After the break Tony Gray sent an effort just over the bar and George Horan headed over from close range. Further efforts from Gray and Marc Williams went begging before Glennon pulled off a great save in the last minute to deny Nathan Jarman a certain winner. Chester complete their highly successful season with a visit to Worcester City on Saturday. The game will be the last ever played at the 108-year-old St George’s Lane ground and is an all-ticket sell-out. On-loan Leeds United players Nathan and Lewis Turner have returned to the Yorkshire club. Both have made a huge contribution to the side since they joined the club. Nathan made his debut from the bench at Brackley Town in mid-December 2012 and scored in his first start at Droylsden on New Year’s Day. 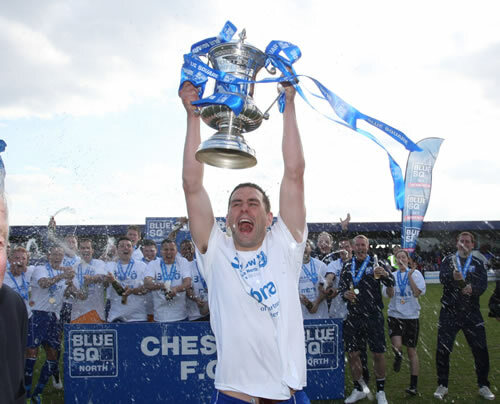 Nathan went on to make 15+5 appearances for Chester. Lewis, who joined his brother at a later date, made his debut in the home victory against Witton Albion in the Cheshire Senior Cup and will be remembered for scoring the club’s 100th league goal of the season against Boston United that clinched the championship. 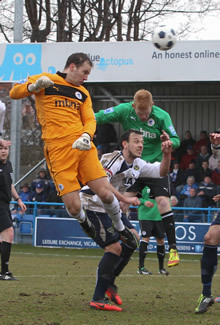 Lewis went on to make 8+1 appearances for Chester. Chester born captain George Horan received the Football Conference North championship trophy from Football Conference President Bill King following Saturday’s match against Solihull Moors. A surprise home defeat, in front of a crowd of 3,414, couldn’t dampen the spirits as the skipper lifted an unprecedented third successive championship trophy in as many years. For the third successive year the club will be honoured with a civic reception by Cheshire West and Chester Council and an open top bus parade through Chester, this will take place in the afternoon on Saturday 11 May. The Conference North championship and Cheshire Senior Cup’s will be on parade as the bus leaves the ground at 14.00hrs before heading to the Town Hall. The route will be: Bumpers Lane, Sealand Road, Southview Road, Raymond Road, Canal Street and Northgate Street. It is expected to arrive at the Town Hall at 14.30hrs. Chester lifted the Cheshire Senior Cup last night following a hard fought 2-1 victory over Stalybridge Celtic at Wincham Park. It is the first time the club have won the magnificent trophy since the 1931/32 season. A blustery wind throughout the night spoilt the game as a spectacle as both sides struggled with the conditions. Chester took the lead five minutes before the break as Antoni Sarcevic converted a penalty, off the left hand post, after he had been brought down by Joel Bembo-Leta chasing a Matty McGinn through ball into the box. The Celtic defender was given a red card by referee John Dowd for the foul. Chester saw a couple of efforts go close before the ten men of Stalybridge drew level on 59 minutes as the Blues defence was caught on a quick counter attack. Chris Hall turned Lewis Turner on the edge of the box and shot under the advancing Martin Fearon. A minute later though Tony Gray scored what proved to be the winning goal as he charged down a clearance from Celtic ‘keeper Alex Cairns on the right before skillfully curling a shot into the unguarded net from an acute angle. Chester have lined up their first home pre-season friendly for next season as Bolton Wanderers will visit on Saturday 27 July. The club are also hoping to stage a home match against Crewe Alexandra in the same month, they are just awaiting confirmation from the Gresty Road side. Chester suffered only their second league defeat of the season when they were beaten 2-1 at second placed Guiseley on Saturday. It was their first league reverse after 30 matches. Manager Neil Young was unhappy about the way his side conceded two goals through mistakes, both scored by Josh Wilson, though Chester were also guilty of missed chances at the other end. Guiseley gave the Blues a guard of honour before the match and took the lead through a free kick in the seventh minute as Wilson punished a foul by Matty McGinn to curl the ball past John Danby. Chester equalised on the stroke of half-time as Tony Gray glanced a corner home. Antoni Sarcevic missed a great oppoutunity to give the Blues the lead on 66 minutes before Wilson scored his second goal, shorltly after, chipping Danby who had come to out narrow the angle on the striker. Captain George Horan picked up an achilles injury and was replaced at half-time. It will be the first time Chester have played in the Senior Cup final since the 1931/32 season, their first season in the Football League. The match will be segregated with Chester supporters allocated the Lostock End of the ground, next to the car park. Admission prices for the final, kick-off 19.45hrs, are: Adults £8.00, Seniors and Children £3.00. Chester have been allocated just 650 tickets for the last match of the season at Worcester City on Saturday 27 April, the last game to be played at the St George’s Lane ground. Tickets will go on sale to Season Ticket holders (bring Voucher H, it is strictly one ticket per voucher) from 10.00-16.00hrs on Monday 15 to Friday 19 April with final ticket sales for Season Ticket holders closing at Midday on Saturday 20th April before the home game with Solihull Moors. The will be NO ticket sales following the match on 20 April. Any unsold tickets will then go on general sale from 10.00-16.00hrs on Monday 22 April to Friday 26th April. The prices are as follows: Seats Adults £14.00, Concession £10.00, 16-21 Year olds £7.00 and Under 16s £5.00. Standing: Adults £12.00, Concession £8.00, 16-21 Year olds £5.00 and Under 16s £3.00. Lewis Turner scored Chester’s 100th league goal of the season as the Blues held off Boston United to clinch their third successive championship after second placed Guiseley were beaten at Brackley Town. A nervy game saw The Pilgrims have the better of the chances in the opening period but Turner struck in the first minute after the restart ghosting in at the far post to plant a firm header past Dan Haystead in the Boston goal following good build-up play from Matty McGinn and Nathan Jarman. Chester, who were playing with five changes from the side that won at Gainsborough on Thursday night, could have added to their tally on a couple of occasions following the breakthrough with Nathan Jarman seeing one close range effort dribble agonisingly the wrong side of the post. A pitch invasion greeted the final whistle following four minutes of tense stoppage time as the score line from Brackley was confirmed and the players and management could celebrate a magnificent achievement in the main stand and then vociferously in the Blues Bar following the game. The team will be presented with the Conference North trophy at the final home game of the season against Solihull Moors on Saturday 20 April.  BBC Radio 5Live Non League Football Show – for interviews and reaction to the championship success (available for one week only). Chester edged closer to the Conference North title last night with a 2-0 victory at Gainsborough Trinity. First half goals from George Horan and Tony Gray were enough to take the unbeaten run to 29 matches and bring 100 points for the season, a league record. The Blues are at home to Boston United on Saturday and should they better the result of second placed Guiseley – who are away at third placed Brackley Town – then they will be crowned champions for the third successive year. SIX POINTS AWAY FROM TITLE? Chester could wrap up their third successive championship at the weekend should they defeat Gainsborough Trinity tonight and Boston United on Saturday. Guiseley could match Chester for points (maximum 103) but the Blues currently have a far superior goal difference of 30 goals more that their rivals for the top spot. Guiseley’s 1-1 home draw with FA Halifax Town last night set up the scenario. Boston are the only side to beat Chester in the league this season. Goals from Matty McGinn and Dom Collins gave Chester a 2-0 home win over Cheshire rivals Altrincham to bring a maximum six points from Easter. The Robins arrived at Chester with a eight match unbeaten run and showed their quality in the second half. McGinn opened the scoring midway through the first half after a one-two with man of the moment Tony Gray on the edge of the box before unleashing an unstoppable shot past Stuart Coburn in the visitors’ goal. Sean Densmore had a great chance to equalise but sliced wide at the other end. Nathan Jarman just failed to meet a through ball to set up a second after the break before teh Robins created, but failed to convert, several chances of their own. The game was wrapped up six minutes from time as Collins, into the side that won at Colwyn Bay for Paul Linwood, was first to react as a George Horan cross was not cleared. Records were broken on Monday as the unbeaten league run reached 28 matches and the 31st victory of the season is also a Conference North record previously set by Kettering Town six years ago.